In the last weeks i got three more gadgets to play with and write about. Unfortunately this means that i have to spent more time fiddling with this stuff and less time to blog. But expect to read more about me trying to do useful stuff with them. So i thought i should give you a glimpse of what these gadgets are and what i want to do with them. Maybe you have additional tips for me. After trying to get one right after the last years announcement at FOO Camp 2006, i finally managed to get an alpha prototype of the Chumby. I think it’s one of the very first prototypes in Europe. Thanks a lot to Chumby Industries for providing one for me. 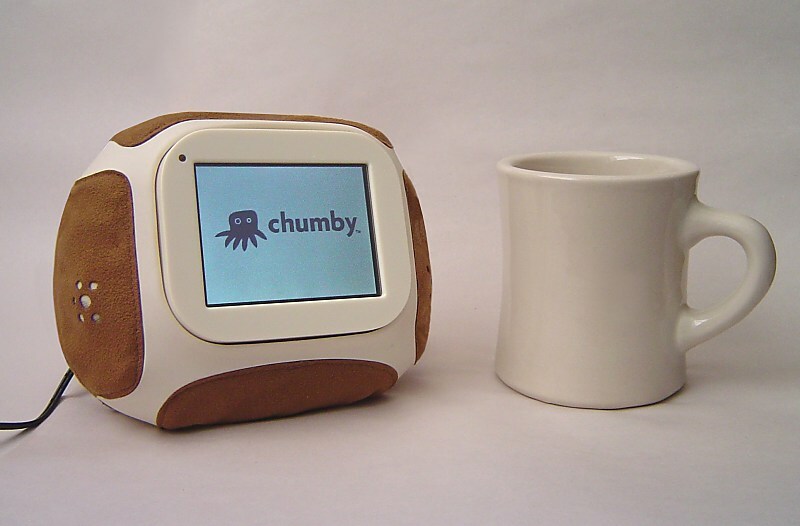 So what is a chumby? IMHO it is NO LESS than a new class of mobile/nomadic device. Based on Linux it uses Flashlite as it’s frontend and comes with a widget ecosystem that enables everybody to download and develop all kinds of news and information widgets as well as games, clocks etc. It basically allows you to get a glimpse of your personal internet highlights while walking by while substituing devices like a radio clock, a digital image frame etc. and all this fro arounf 150$. Below you can see an embedded preview of my current chumby content selection. Right now i’m testing various news feeds as well as different clocks (am i still able to easily read a binary clock?) some pictures etc. 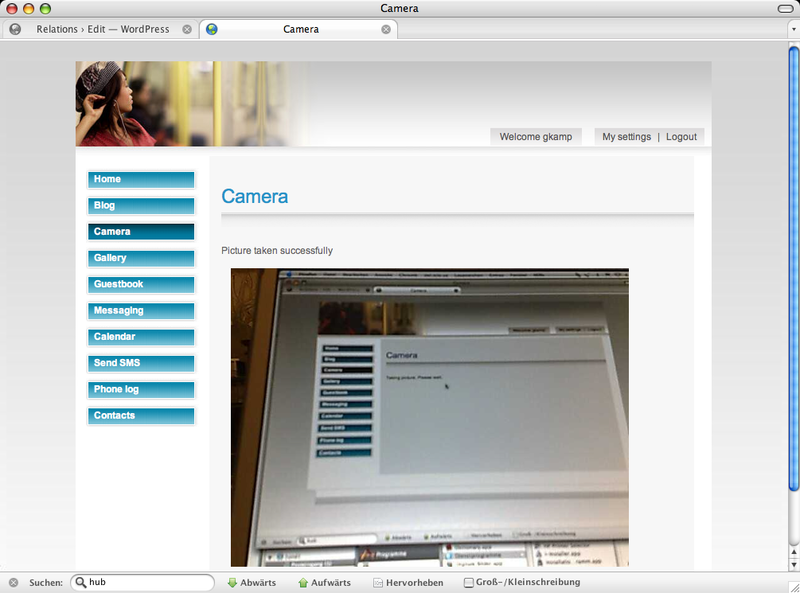 These widgets are selected at a web portal and than synchronized to the chumby via WLAN connectivity. In addition to a 320×240 touchscreen it comes with an accelerometer sensor, and those capable can add a sensor package with additional sensors etc.Even the alpha prototype looks quite stable to me and the biggest hurdle in setting it up was tofind a compatible power adapter for european sockets. If i have to give it back i would definitely miss it and i’m looking forward to the production unitsAnd just today Chumby Industries revealed some more information on the production units at FOO Camp 2007. They are going to ship with FlashLite 3.0 (this means Flash 8 compatibility and will have hardware support for H.264 and H.263. They will include a night/dimmer mode (greatly acknowledged at my place). and are thinking abut electronics packages as well as a FM radio add-on See more of the specs over here. So this will make a hell of a video and audio streaming device. With Youtube switching its content to H.264, and being iTunes and iPod based on that codec, i’ll expect lots of video widgets popping up. All the other design changes make given my limited experience a lot of sense to me and as long as i’m able to come up with another enclosure for it. Power consumption is down to 2.5 Watts but i guess that is still too much for being able to do a docking station and handheld design using e.g. modern lithium-ion rechargeable batteries. This would be my favorite. Anybody working on that? Since i have an alpha prototype i’m trying to talk chumby industries into providing me with a production unit as early as possible. I recently also added an AppleTV to my home computer line up. The plan was to attach the AppleTV to orur LCD TV and repurpose the currently attached MacMini either as a standalone server or to attach it to LCD screen in the front door of our fridge. Unfortunately, despite the AppleTV working seamlessly with all kinds of LCD screens, and the LCD TV (a Philips 26PF9946) working seamlessly with the MacMini, an iBook and two MacBookPro, i can’t get the screen to work with the AppleTV. Until now i contacted both Philips and Apple support and put up a question on the AwkwardTv forums. The main reason for buying the AppleTV was to test the capabilities to add PlugIns for displaying feeds and eventually using Quartz Animations for doing so. So all this has to wait until i get the LCD TV up and running. My most recent addition is a Nokia N95. I needed a replacement for my tried and true Nokia 6630 in order to be able to test the mobile messaging platform and the other mobile applications i’m responsible for at work. Since this device has to last at least two years only the latest and greatest device does make sense. The Lifeblog app claims to support the ATOM Publishing Protocol (APP), but first tests indicate that the support is pre-standard and does not work out of the box with WordPress 2.2. Especially the WSSE authentication and the feedlist format (pre-standard). The web browser is like the iPhones Safari-Browser based on WebKit and enables one to write web-based apps that should also run on the iPhone. The WLAN and Bluetooth connectivity should enable to build some nice remote. But what makes the N95 unique for my purposes is the combination of a 5 megapixel camera and a GPS receiver accessible from a Python implementation. This should make it easily possible to geotag the photos or write a gps logger app. This alone is already a quite exciting outlook for a geek like me. But what makes it really interesting is Raccoon: the port of the Apache Webserver that also includes mod_python and enables one to write scripts that e.g. ask the owner of the phone to take photos, access the contact list and calendar, send sms and flash SMS to the phone and do all other kinds of cool things. This is true web-based development of mobile applications and i expect very interesting developments to take of based on this possibilities. While Raccoon was and still is only interesting to serious geeks like me, just this week Nokia announced a more consumer oriented version called Mobile Web Server. I’ve just registered my subdomain, so you can have a look a look at gkamp.mymobilesite.net. Expect me to try some things over at this site. 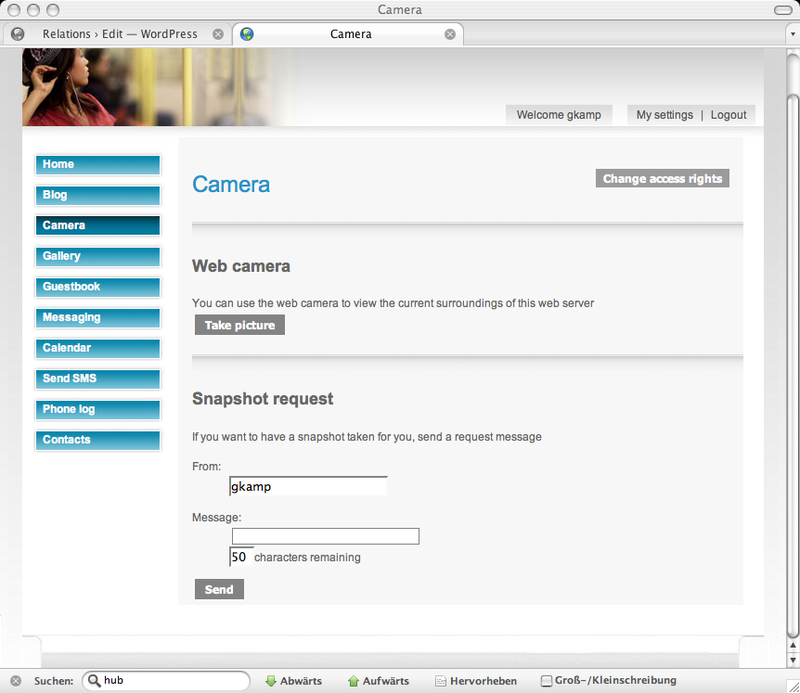 The Webserver can also be run locally (either in the WLAN or locally on the device). Raccoon and Python should especially provide the building blocks for a wireless remote imaging solution similar to the Pict Earth solution Ed Parson recently raved about. Unfortunately i don’t think that the mini copter i got at the Google developer day is able to carry a N95. But maybe it is a way to simplify the setup of the universal aerial video platform. But also without a flying vehicle the possibilities that stem from the combination of Python and apache on a mobile phone are worth to be explored.